Ukraine may be descending into chaos, and some triumphalists in the West are again tempted to meddle and fan the fires of chaos and revolution, perhaps with a near-term aim of a partitioning the Ukraine along its historic Orthodox-Catholic fault line. Seaumas Milne describes the chaotic state of play in Ukraine in this commentary in the Guardian. In so doing, Milne shows how the west is fueling revanchist fascism. Note the familiar role being played again by meddlers like Nato Secretary General Anders Rasmussen and Senator John McCain. According to Milne, they are encouraging the rise of Ukraine’s nascent fascism and rising instability to roll back Russia’s influence among its immediate neighbors. But the Ukraine, like Georgia, is too close to home. Ukraine is likely to prove another bridge too far that triggers a Russian reaction by the wily Mr. Putin (the man, who recently intervened to stop the US from going to war in Syria). And Putin’s reaction may well be portrayed as a reason to restart the Cold War with Russia. Combine these efforts in the Ukraine with the ongoing push to start a Cold War with China (Obama’s Pacific pivot and the Navy-AF budget plan for the so-called Air-Sea Battle) and the halcyon years of ever rising defense budgets may be again in the political offing, triggered by yet another wave of Cold War hysteria. But this time, the MICC’s (Military-Industrial-Congressional-Complex) jumping off point will be from today’s far higher Defense budget. Hackworth meant the number one budget priority in the Pentagon and the Halls of Congress is to reward the domestic political faction that benefits from buying and operating high cost, high complexity weapons at the expense of (1) weapons that work for the men and women at the pointy end of the spear and (2) providing an affordable defense program that does not rob taxpayers of money needed for other national needs — like roads and sewers, schools, social security, etc. The faction that benefits from a policy to spend on “toys” is the coalition of (1) weapons contractors, (2) military officers and civilians who promote those weapons to enhance their careers and post retirement employment opportunities, and (3) legislators who benefit from the increasing flows of dollars, jobs, and profits to their districts. This trinity is the primary faction that benefits from the development, procurement, and contracted support dollars associated with buying hyper-expensive programs like the F-35, the B-2 bomber, the new aircraft carrier, etc. But it is not the only grouping that benefits. There are other less obvious players in the Military – Industrial – Congessional Complex (MICC) — including, inter alia: influence peddlers and wannabees in lobbying firms, so-called intellectuals in think tanks who derive their funding and influence by rationalizing the party line for the programs and money flowing to MICC. Their collective behaviour is lubricated by the network — really an intricately woven tapestry — of revolving doors leading into and out of jobs in the Pentagon, Congress and industry. Other beneficiaries of this promotional network include those who make money or gain access to power by hyping the benefits of the ‘toys,’ including members of the press, particularly the broadcast media, movie makers (e.g., Top Gun), novelists (e.g., the late Tom Clancy), etc. There is slew of lesser important fringe players as well, including professors in universities, and all sorts of enthusiasts and groupies, feeding off the tributaries of the golden flow to the main players. President Eisenhower presciently warned us about this web of interests in his farewell address in 1961. Today, its distorting influence on the popular imagination pervades American culture, from to bottom to top; from our school rooms, to the hobby shops selling video games, to movies, to the thinly disguised advertisements on content generators, like PBS’s so-called advertisement-free Newshour, to the faux patriotism of flag pins on the lapels of politicians and yellow ribbon bumper stickers. Yet notwithstanding all the technical hype about revolutionary military capabilities embodied in our vaunted technological supremacy (i.e. in Hackworth’s ‘toys’), America’s success in real war has been dismal since the end of WWII, even while the resources devoted to these wars have gone thru the roof. The accumulating strategic and economic disaster has now metastasized in the ongoing global war on terror (GWOT) that began on 9-11. The figure below is the proof. 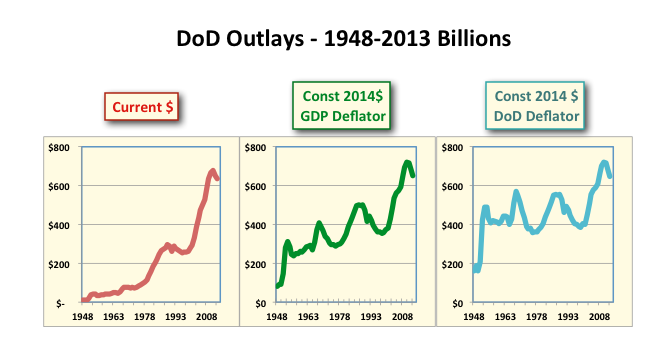 Based on official DoD data, this chart plots the defense budget in inflation-adjusted dollars over time. 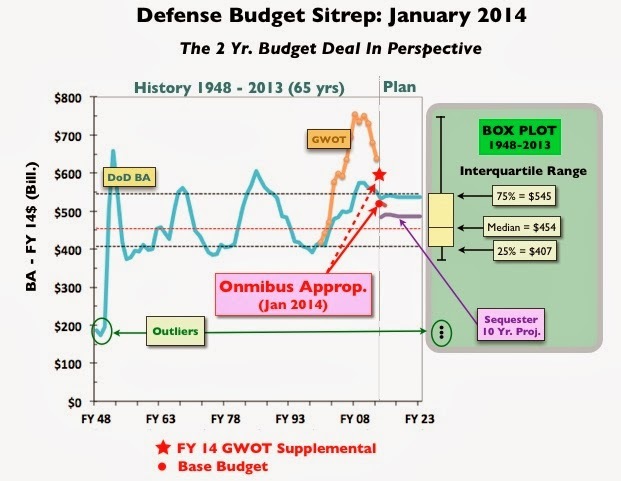 It also places the historical budgets in the context of in the omnibus spending bill just passed by Congress and signed by the President, as denoted by the red markers. The red “ball” depicts the base budget and the red “star” adds the supplemental war budget to the base budget, making it logically equivalent to past budgets. The recent budget deal, in effect, says the United States will be spending more defense in FY 2014 to pay for 30,000 troops disengaging from a low-tempo war in Afghanistan than we payed in 1969 to keep 550,000 fighting a high-tempo war in Vietnam. Moreover, in 1969, the defense budget also paid for much the larger forces needed to support a full-blown Cold War against the Soviet Union; whereas today, there is no funding requirement even close to that of the cold war. In a normal world, it would be reasonable to ask what has all this money bought for the American taxpayer? Consider first the GWOT: Iraq is a bloody disintegrating shambles; we are leaving Afghanistan with our tail between our legs; Libya became a fountainhead for weapons flowing to Jihadi factions throughout Africa and the Middle East; the drone war is creating enemies faster than we can kill them. And yet … no one in the MICC is being asked to explain how spending so much money could be correlated with the rise of such horrific problems. In fact, the Pentagon cannot even (and does not want to) audit its books, and Congress says it does have to pass one until 2017, even though it passed the law requiring the audits in 1990 — see this link for a recent in-depth series of Reuters reports describing this problem. So, what is driving the budget train? How can a citizen come to grips such a huge disaster, without being overwhelmed by the variety of its ever-changing complexity? Occasionally a sharp ray of sunlight shines thru the narrative fog of techno-hype that is blanketing this mess to expose the truly sordid nature of the MICC’s game, so pithily summed up by Colonel Hackworth. My good friend Andrew Cockburn brilliantly exposes the real nature of the Air Force’s efforts to trash its most effective and cheapest weapon system — the A-10 Warthog, one of the few “toys” that works for the “boys” and the “taxpayers” alike). And in so doing, Andrew provides an excellent case study of how the dirty game is played. The Air Force admits the A-10 is very effective and is low cost, but claims it is being forced to send the A-10 to bone yard as a budget ‘austerity’ measure in order to save more expensive, multi-use programs, like the problem-plagued horror of horrors: the wildly expensive stealthy F-35 Joint Strike Fighter. Cockburn’s report, Tunnel Vision: Will the Air Force kill its most effective weapon?, is in the forthcoming February 2014 issue of Harpers. While Andrew does not address the bomber question, I believe the A-10 caper is a cog in a larger gaming strategy to open a financial window for developing and buying a new long range stealth bomber. This monster could make the F-35 look like an exercise in prudence. Even though it is still only a paper airplane, bordering on a fantasy at this point, the Air Force wants to spend $379 million on it this year. And its cost has already begun to grow: the long-term procurement cost of a program for only 100 bombers recently rose from $55 billion to $81 billion, or by 47% – and the serious design work has not even begun! Moreover, this new strategic bomber can only be justified by a ‘strategic’ need to destroy so-called critical economic nodes of a rising superpower threat. The only possible candidate is China, the world’s largest exporter and second largest importer. China is crucially dependent on shipping routes thru a few narrow, vulnerable choke points leading to and from its huge, easily bombed container ports on the coasts of the South and East China Seas, like Shanghai. Nothing would enrich the future fortunes of MICC, and especially the Douhetian strategic bombing faction that controls the Air Force mentality, than a new Cold War aimed at ‘deterring’ China, whatever that means. This deterrence would be achieved by having a U.S capability to deny China access to world markets. This is the real intent behind the vacuously-stated anti-access/area denial (A2AD) gibberish so popular in the AF and its wholly owned subsidiaries in the defense press and thinktanks. To pulse its popularity — ask the Google. It is the low cost of the A-10 that is the central to understanding the salience of Andrew’s brilliantly written exposé in this larger game. Sending the A-10 to the bone yard won’t save much money in the grand scheme of things, but the A-10s effectiveness has become an embarrassment — a blemish in the AF’s patina of strategic bombing and techno-war. That blemish must be removed from view. Cockburn’s essay is important because it gives the reader a sharp insight into the outrageous lengths the AF is willing to go to promote its budget-busting vision of hi-tech perpetual war based on strategic bombing and victory thru airpower alone. I urge you to read Andrew’s essay carefully … and pay particular attention to the explosive implications of the coverup implied by his closing line. Gareth Porter and Robert Parry, two of our nation's finest investigating reporter/historians, deserve kudos for placing the self-serving nature of former Defense Secretary Robert Gates' memoir into a proper perspective. Readers should bear in mind that the soap-opera-like gaming of Obama in 2009 into acquiescing to the fatally flawed plan for a surge in Afghanistan surge, described accurately by Porter and Parry below, was clearly obvious well before Obama made his decision to cave into the pressure exerted by Robert Gates, Hillary Clinton, and the Generals and their neo-con allies in Congress. To be sure, Obama was also feebly playing the game by leaking differences of opinion to the press -- but his was an amateurish operation by an inexperienced malleable politician and his pissant staffers. Those on the other side were pros in manipulating the wholly owned subsidiaries in the press and Congress. Predictably, as explained below, the brass hats won in 2009, notwithstanding a well publicized last ditch effort to stop the madness by Ambassador (and former General) Karl Eikenberry. Now, with the publication of his memoir, Gates is attempting to deliver a coup de grace to Mr. Obama on the dawn of a mid-term election -- which shaping to be a bad one for a hapless President and suicidally-minded Democrats ... and this is just an opening shot. Benjamin Netanyahu, with the help of many Democrats as well as Republicans, has another exceeding dangerous caper waiting in the wings (more on that later). Criticism in the memoirs of former secretary of defense Robert M. Gates of President Barack Obama’s lack of commitment to the Afghan War strategy of his administration has generated a Washington debate about whether Obama was sufficiently supportive of the war. Special Report: Former Defense Secretary Robert Gates is slamming President Obama in a new memoir, accusing him of lacking enthusiasm for the Afghan War. But perhaps Obama’s bigger mistake was trusting Gates, a Bush Family operative with a history of dirty dealing, writes Robert Parry. As Barack Obama is staggered by a back-stabbing memoir from former Defense Secretary Robert Gates, the President can’t say that some people didn’t warn him about the risk of bringing a political opportunist like Gates into his inner circle on national security.